The FusionLess® Optical Connectos by LanPro are pre-polished, pre-assembled connectors compatible with the standard LC or SC connectors. In place of epoxy, an internal mechanical grip gently but effectively holds the fiber in place and can be installed in under two minutes. Without polishing or adhesives, the FusionLess® Optical Connectors make installations quick and easy, eliminating the need for costly Fusion Tools or epoxy curing and hand polishing at the work site. The FusionLess® Optical Connectors come with an assembling jig and fiber holder, making for an accurate alignment and fiber cleave when terminating the connector. 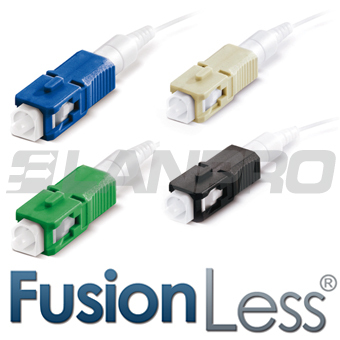 The FusionLess® Optical Connectors by LanPro are pre-polished, pre-assembled connectors compatible with the SC or LC standard connectors.